Finally back to part 2 of the Bubble Chocolate Review. Enjoy!! I really liked the Bubble Chocolate it was actually very smooth and not as strong as most chocolate bars I’ve reviewed. I prefer this type of chocolate mostly. The texture was great although I guess I was too hungry to wait for the “melt in your mouth effect”! Overall, I liked it and now I see why my nephew said it was awesome in the first review! 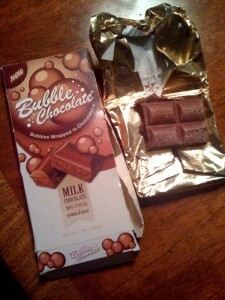 Would you like to try Bubble Chocolate Free?? Enter the contest Below!! Enter The Bubble Chocolate Contest!! Win Bubble Chocolate Milk and Dark Chocolate Bars!! Note: The contest is limited to contestants with USA addresses and P.O. Boxes are not allowed. The winner is chosen randomly if all entries are included and will be announced on next Tuesday August 31st by video on Candy Tuesday’s! You have 48 hrs to respond or your winnings will go to the next winner in line!